This 19th century church’s architecture is mainly Classical, with some Baroque influences. It is famous for its lavish, romantic and dramatic painted interior (especially the ceiling), but it’s the lovely sculpture work that people really freak out over. It’s treasury is significant too, containing the 17th century CROSS KIR Veniamin HARTOFILAKSA, the Reliquary of vice-abbot Mileševac Longin, and other chalices and lamps made of precious metals. Several important people are buried in the churchyard here, including Prince Milos and Prince Mihailo Obrenovi, Dositej Obradovi and Vuk Karadzi. The church also has the relics of Prince Stefana Štiljanovi. It’s built on the site of an older 17th century church. Hours given are for the church shop. How popular is St. Michael's Cathedral? People normally club together Belgrade Military Museum and Republic Square while planning their visit to St. Michael's Cathedral. When we entered the church, in the central hall, behind the bulkhead, was one guy who was lying and doing something on his mobile. I think that is unapropriate behaviour in church. Almost disrespecting. The Church is very beautiful. It's quite an imposing place, maybe not easy to be a tourist in it, since you may disturb somebody, but as long as you don't rush around it's basically enjoyable. I think they had some sort of sound system with orthodox music on (reeeeally quiet) which added an extra bit of solemnity. 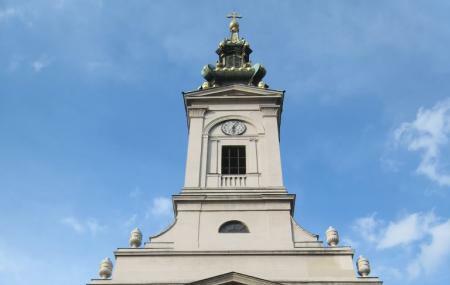 The Cathedral Church in Belgrade is located at the crossroads of the leaders of the Prince Sime Markovic and King Peter. On the site of today's church there was an older one, dedicated to the Holy Archangel Michael. The church church as a stationary cultural asset has the status of a cultural monument of exceptional importance, by the decision of 1979. With its architecture, artwork and rich treasury, it is an exceptional cultural monument. It is an invaluable historical heritage related to the fate of Serbian Belgrade of the first half of the 19th century, which just formed in the area around the Church of the Sabor, becoming its church, administrative and cultural center. At a time when new social and political circumstances in Serbia are gradually emerging, the Saborna Church has become the head of the struggle for the independence from Turkish centralism until the final liberation from centuries of slavery.